t*rexes and tiaras: Tuesday Titles 112.. I'd never imagined that a book written about assisted suicide could be amusing and entertaining, but apparently it can. 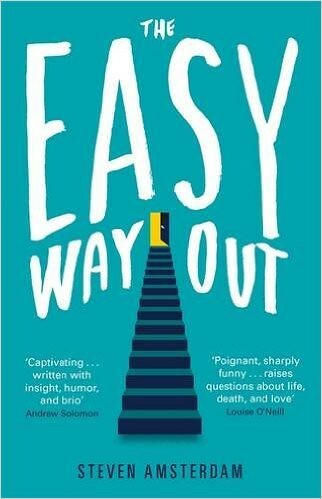 The Easy Way Out focuses on Evan, a male nurse whose job it is to administer a lethal final drink to those who ask for it. Landing in the job due as a result of circumstance rather than ambition, he is nervous, to say the least. With every moment of every procedure caught on camera for later dissection by his superiors, it's not surprising that Evan spends a lot of his spare time thinking about death. With his mother gradually succumbing to Parkinson's disease, and Evan himself coming to terms with his own lifestyle choices, it's safe to say that this book raises some emotive issues. I have to say, I enjoyed the writing style; fast-paced and witty all of the way through the book. I felt this was the perfect contrast to some potentially tough subject matter, so can't fault the writer at all in that respect. Everyone has an opinion on how they'd choose to die, I'm sure. I'd recommend this book as it gives a good look into an alternative viewpoint, deals with some challenging issues and somehow manages to remain entertaining. you read an interesting array of books!